Tour Divide is a solo, self-supported, mountain bike race across 2,745 miles of ACA’s epic Great Divide MTB Route. The race lasts around three weeks so it is a contest for the ultra-fit. If you want to ride with this guys – please have an illustrator vector file free download of Quebec, Canada, Free Printable Map in Adobe Illustrator and PDF. Level 12 (5000 meter scale) map, G-VIEW, fully editable, in in vector format. The Great Divide Mountain Bike Route is the world’s longest off-pavement biking route. It travels through the Canadian Provinces of Alberta and British Columbia, and the United States of Montana, Idaho, Wyoming, Colorado, and New Mexico. Over forty riders have been equipped with GPS so that we can follow their progress on Google Maps. Each individual rider has been given their own Google Map which displays the rider’s current position. 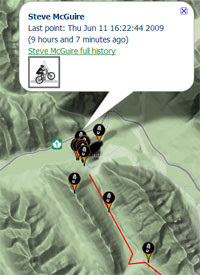 There is also a leaderboard map which shows all the riders on one map. The map also includes a red polyline to show the route of the 2,745 mile race.